In a fast moving world, patience, taking the time to plan thoroughly, taking the time to think through things, etc. are often attributes forgotten or frowned upon. Today, we seem to be in a world where rush, panic, fast solutions and fast food holds, or seemingly holds, an upper edge. And then, there are those who decide to remain unaffected by all that noise – who are very much at home when it comes to walking against the tides. 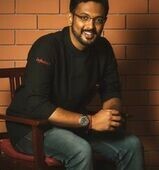 Meet Arun Vishwanathan chocolatier and co-founder of Infusions Café! When the world was in a rush, he decided to take the time to study, think, observe and plan his venture. When the world sought means to make money, he kept his passion burning and earned his wealth. Today, Arun has to his credit two Master degrees, a café that is a unique world on its own, an award-winning chocolate brand, a Ph D that is in process, strategic business thinking skills and undying passion! When one thinks being fast and quick is everything because it is the need of today’s world, success smiles at Arun at the age of 29, telling a tale that is quite in contrast. Excerpts from a recent conversation. I am Arun Vishwanath and hail from Coimbatore. I did my graduation in Biotechnology from Tamil Nadu Agricultural University (TNAU). I was always inclined to the food industry – food processing, catering, etc. – something on those lines. After my graduation, I was landed with an opportunity to do a dual Masters programme in Cornell University, New York and Agricultural University, Coimbatore. Both these universities had a tie up and TATA scholarship was offered. And so, I did my first Masters in food science and technology from Cornell University, New York and my second Masters was in MTech in food processing and marketing from the Agricultural University Coimbatore (TNAU). That was how I entered the food science of food processing industry. What got you interested to join Tamil Nadu Agriculture University (TNAU) ? To be very honest, I was not very good at Mathematics. Another thing is that my family was an agricultural family, my dad was a professor at the Agricultural University. Although he had an engineering background – he was working with the agricultural engineering department. I had an inclination to this field from school days itself. I did Biotechnology because it was very new to me and I was curious. And it did open a lot of avenues as to what lies in the agricultural field. So, I took it forward. What happened after TNAU ? I had the opportunity to go back to Cornell for my Ph D; and I had other opportunities unfolding here, in India, too. I opted to take up a job in Coimbatore – I was working at a dairy and was there for 6 months. But, I wanted to do more on the lines of confectionary. During my time at Cornell, I began developing this liking for chocolate and the confectionery industry – I had worked on a project on marshmallows. As part of that, I got to visit the Hershey’s Chocolate Factory, etc. It was my inclination towards the confectionary field which got me curious about baking, etc. Once I got back from Cornell, I got back to doing my second Masters. While I did that, I developed an interest in Microbiology as well. Hence, I was swinging between choosing between these few options, both of which I was interested in. I finally went ahead with the food processing industry. My specialization from Cornell and my other Masters shaped me as a product development specialist – I create new products. As a result, my work in the dairy was more into product development and customer handling. It was a private dairy. It was a really good job. But, I wanted to explore more. This inclination to explore, see more etc. was the reason for me to decide to leave the city. I went to Bangalore for a few months in 2013 and got trained in baking through a Central Government programme for baking and confectionaries. Then, I was in Belgium for 45 days, where I learned the art of chocolate making. I got that done in 2 months. After that when I was thinking of starting something in Coimbatore, I got an opportunity through TNAU to go to Belgium and be an apprentice in one of the chocolate factories. I took that up and that really is why I am a chocolate manufacturer today. I got back from Belgium in early 2014. It then took me a year to set up Infusions Cafe and start the venture. End of 2014, my mother, who was the proprietor then, and I, co-founded our company called DND Foods. We started a brand called Ganache for da Chocoholics. This venture is still on. It is our corporate gifting solution, or rather, chocolate gifting solution. That is another brand that we are running at Coimbatore, Chennai and Bangalore and we have been doing it for 5 years now. What made you want to do something on your own? See, I was not the brightest of students during either school or college days. I was one of those guys who enjoyed doing new things. I used to explore food from a very young age. I remember this fancy idly shop in Coimbatore that came up when I was in my 8th grade. By the time I got to 10th grade, I contemplated opening a franchisee of that place. I was always a curious child – someone who wanted to be my own boss. I have always preferred that to working in a firm. Another factor is that I do not really work well when given a certain task with a set direction. I am a person who loves to explore and be creative. I am an extremely passionate person. I work passionately, rather than just looking out for the money. After Cornell, I was flooded with opportunities. There was a huge scope and potential to settle abroad. But, I was never really inclined to settle abroad. I had family reasons as well. My parents wanted me to go abroad. But I was more inclined to being at home – being with family. I have always wanted to stay back in India. That is the reason I declined the Ph D and job offers that came my way, back then. And then, after a certain stage, I had to begin somewhere. My mother was really supportive about me starting my own venture. I agree with her point of view that it was a gamble – a small one. 5 years back I was around 23 years old. I was at the right age to gamble and analyze if things go the right way or not. If not, I could always look for a job. I didn’t imagine any scenario which would be entirely disastrous. Hence, the decision to start this venture. Did your family have any traditions that go the business way? No, not at all. Well, to think of it, my mother’s family did, in a small way. But, my dad was strictly against business ventures. He retired as the Dean of TNAU and was more inclined towards me engaging in the education field. He wanted me to do my Ph D and all that. But, my mother and I were clear about a lot of things. In fact, she also wanted to do something and she was very supportive to being part of my venture. End of 2014, we started the venture from home. We started with fusion chocolates – infusing Indian fillings into chocolates. My thought was around how we could scientifically blend the ingredients using my food science background into a certain ganache. I explored how the texture of a certain fillings can alter the taste etc. That is how I finally created brand Ganache, which is gratefully, doing well. Until mid-2015, I was running this out of my home. End of 2015, we started a very small store on the top of our house and we ran it for a few months. The store though it did well, just doing chocolates alone did not make sense for the audience. It fetched us corporate orders but it didn’t really do much in terms of every day walk ins. The consumption of chocolate every day is too far fetched an idea for our lifestyle, and this is me included. I realized that my home store was a good idea in terms of a startup but it didn’t make sense for the long haul. So, in 2016, I decided to shut the store and still run it as a corporate gifting solution. I always had a good bonding with Cornell University. Beginning of 2015 and 2016, there was a programme which Cornell did in India at the Hyderabad Sadhguru Foundation, again in association with the TATA group. It was an Indian Agricultural and Rural Development (IARD) programme. This was part of the Cornell course. I was part of that programme. I hosted the 60 students in 2015 and 2016 at my work premises and conducted a workshop on chocolate making, etc. Early 2016, my Cornell professor wanted me to go to Cornell again and give a talk in chocolate making to the food science department. So, in Feb 2016 I went back to the US, did a workshop for the students at Cornell and also had a few days of Bean to Bar chocolate making sessions in San Francisco. I went to San Francisco as a guest and was there for a few days. That was the phase when the bean to bar idea got rooted into my head. Also, the idea of exploring cocoa and chocolate in different options other than just any other chocolate was exciting. So, in 2016, I got back and decided to start on this venture we now called Infusions. I began constructing this store and it took me a year to get the store in place. Is it a physical store ? Yes, it is a physical store in Ram Nagar, Coimbatore. It is a chocolate shop, a café with the idea of fusion food. The concept is of cocoa-infused food, a range of desserts and around 25 variants of hot chocolate. This is the idea behind Infusions. I started the construction of the place in mid-2016. It took me a year to set up this place and mid-2017 I hired freshers. I follow the model of only working with freshers. I hire freshers and train them to work along. We opened the store in October and very soon after that my mother had a cardiac arrest and she passed away. It was a great loss at a personal and professional level. In terms of business, we were in a business partnership. So, her absence is a huge loss in all aspects of my life. From that point things took a difficult turn. The staff were trained, the place was set, and I had a loan on my head. I had no choice but to move forward. So, I had to pull myself up and push myself to get the store running. I did a soft launch – a trial run exactly a year ago. On the 22 January we started having a trial run for Infusions Café. We had our actual launch on the 31 March, 2018. That was about Infusions! The other chocolate brand that came into play, for which we recently received the International Chocolate Award is a brand called Chitra’m. That’s my other venture called Bean to Bar. How is that doing now? It is a year since the soft launch and 9 months since the full launch and we are really happy with the sales. This is something similar to the chocolate-based stores you have in Bangalore, for instance. What sets us apart is that we launched a food menu. Our cuisine is called the Cacao cuisine. It is basically adding cocoa to your everyday diet without it being sweet or bitter. I am using cocoa as an ingredient. We have got something called the Nibcrist Malai Paneer Tikka. There is a marinade made with chocolate and filling. It is one of our best-selling products. We have cocoa-olive garlic sauce based garlic bread. Is this concept something that exists in other places? Globally, yes. This is something that you get in many parts of the world, but I don’t think it has been much popular in India, especially with Indian food. I am not of the idea about having this concept with continental menu or plated desserts. I am of the idea of having completely Indian food infused with chocolate. We are making it as Indian as possible. There is also the idea that people love chocolate. Cocoa is really good for health. But, it’s consumption in the form of a drink or a chocolate bar always involves sugar consumption. I am creating this concept where chocolate is consumed with everything that we consume on a daily basis. It can be consumed as a part of a snack you consume. Our food is very similar to home-cooked products. That’s about the food menu for you! Then, we have the desserts -we have around 25-30 variants of hot chocolate. These hot chocolate variants range from turmeric and pepper, sun dried hot chocolate, hot chocolate served with edible gold, dry ginger hot chocolate, etc. We have done a lot of research and trials in hot chocolate when we started the Infusions venture. Besides the foods I have described now, we also have regular fusion foods. Our café has been really successful. So, is your business breaking even? Yes, from the first few months itself. We created a zero wastage model, we hire only freshers and more importantly, we created a model where we created everything is small numbers. We wanted to make sure that we break even from the start. We didn’t want the idea of breaking even in 2 years’ time or so. The shelf life of a café these days are around 2-3 years. So, by the time these setups break even, there are other players and you run out of fashion. I was clear that this is not going to go on forever – not the store and not the product. That is why I was very clear about the idea that I want to run it as economically as possible and that is how I have been running it and we have been doing really well. Are you running it on your own or do you have people helping you out? I am doing it on my own. I am looking into the ideas of a franchisee or also having venture capitalists pitching in, etc. We have had a lot of people who have enquired after us in the last 6 months. We want to have the stability – good backend stability. So we are taking some time on this. In the meantime, we are looking at creating a model which can be sustainable. I should not be in a tough spot once I head in for anything. Tell me about you “bean to bar” business? I was in a working relationship with a company in the US. This company, called CocoaTown, is into chocolate machinery manufacturing. CocoaTown and I have had tie ups and we did workshops in Coimbatore with respect to Bean to Bar chocolate making. We did 2-3 workshops in the last 2 years. This concept of chocolate is growing around the world. Bean to bar chocolate is basically farm fresh chocolate. So, we work with farmers to cultivate a specific good quality bean, getting ourselves involved in the stages of fermentation also. We get the bean from the farmer and we go through roasting and processing stages. This freshly ground chocolate is then made into bars. This is the concept behind bean to bar chocolate making. We are a small batch of bean to bar chocolate makers in Coimbatore. It is also called as the class chocolate market. Are there many players in this space right now? There are, perhaps, around 5-10 people in India. We are very new to the market. My mother, was particularly interested and was very active in our venture idea of the bean to bar chocolate making with CocoaTown and us. Though I wasn’t very keen to enter into the bar chocolate segment, I wanted to launch a brand as a tribute to my mother. That is how the brand called Chitra’m came into the picture. My mother’s name is Chitra and Chitram also mean a canvass – in Tamil, it means a portrait or a picture. So, our idea is to portray chocolate as a canvass and the flavors are the colors on the canvass. The major focus is ingredients and the cocoa. On the 31 May, we launched Chitra’m with 6 bean to bar chocolate flavors. I also make bean-to-bar bonbons. We planned to have it as a retail. During this time, I got certified as an international chocolate taster. We sent our chocolates to the international chocolate awards – Asia region, which happened in Taiwan. We own bronze medals for two of our products – Mango Lassi Milk chocolate and dark chocolate with palm sugar, got awarded in the respective categories. In turn, it also got selected for the world finals which happened in Italy in November. 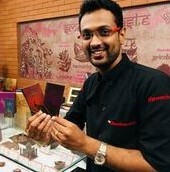 The Mango Lassi Milk Chocolate actually won bronze in the world finals as well. This is how the Chitra’m brand developed. Next month we plan to have present Chitra’m in the chocolate festival at Amsterdam as well. This is our bean to bar chocolate bar journey. We are technologically supported by CocoaTown in the US in our bean to bar venture. How are you finding doing business in Coimbatore ? I would say that Coimbatore actually is not one of the metros. It is a little more conservative in terms of food habits. If you are offering a good product at a not so exorbitant price and when you can explain the product and give a clear picture of what exactly you are trying to do – the market does respond positively. This is my experience! Another fact is that though I did study in the US and Belgium, I am a typical Indian. I do things in the market what I would do if I had to sell my product to my family. So, it was not really hard for me to understand when people asked me why my products were expensive, what was the reason for chocolate being considered healthy, what makes in unhealthy, etc. It was more like being in the education field. I had to be there to explain and tell my customers what’s in it for them when they purchase my products. The problem, perhaps, I would face is when I step out into a wider market. I am only present in a few cities. If I set out venturing into doing business at a State level or if I decide to go global is a space I am not very clear about. I am not sure if someone who I hire will view my customers in the same manner. I am unsure if they will have convincing answers for the customers to make them understand and accept the product. Those are the challenges which I will have to face and I think we are building a team that will be able to handle it efficiently. Also, we certainly are not rushing into the idea of selling a lot of chocolates within a certain period of time. We have not set ourselves up to any targets. For me, after all that we have gone through, the whole idea of just running this; I mean the first step of opening the store itself was a big deal. Initially it was very hard for me to run my store without my presence. Then it became more stable without me actually having to be at the store always. Gradually we are creating a working atmosphere. Having one brand which has a sustainable stable growth is better than having 20 stores and struggling all the way. At the end of the day, the entrepreneurs are an obsessed bunch. The kind of pressure we put ourselves into makes us blind to the fact that there is more than just work ahead. For me, I am very clear about that. I had to start and run the show. I had to create all the basic amenities that are required to have a sustainable store in the long run. Expansion is something that should organically happen. I feel really blessed to be from Coimbatore. The patronage and support that I have been gaining has been really overwhelming. I still cannot define this but, the city is hugely supportive. What is it about Coimbatore that makes you feel that way? Coimbatore is home to many entrepreneurs. Industrial cities, in my opinion, always supports entrepreneurship. People here just love the idea of having a young startup and doing something new. Then there is also the factor of if you are from Coimbatore you are supported. 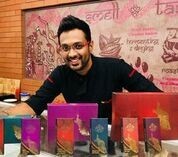 The kind of support, the kind of identity the award winning chocolate created for me in this city – people kind of patronize you! I had, at a very early stage, decided that I am not pooling out my cash on marketing because having my base in a small city, if your product is good, it will speak for itself. One major decision I took that when I want to start something, I will first test the market in my hometown. A good product sold in Chennai or Bangalore will have takers but a good product, which is slightly expensive to be sold in a smaller city was a challenge and I think the city was hugely supportive and encouraging. Whenever people asked me why Coimbatore; for me it was always why not Coimbatore? You have been at TNAU; you have been at Cornell – what is the difference? To be very honest, I learnt a lot about my professional life at Cornell and I learnt a lot of my personal life from TNAU. I would say that I am being able to sell my product in India with a foreign education and foreign product technology comes from my education from TNAU. I believe it is an identity in itself. I could relate to everybody. I can bond with farmers because of TNAU. I still relate to myself as a TNAU graduate before I identify myself as a Cornell graduate. It is more like being at home for me. Cornell was, of course, a game changer. The exposure it gave me, the openness to ideas it has nurtured in me and the confidence that got built in the process is phenomenal. In that perspective, my role model and mentor is my mentor at Cornell. He was the one who confidently told me that my crazy ideas are acceptable in the food industry and the business world. His words boosted my confidence to create my brand. Having said that, without TNAU, I wouldn’t have been able to connect with my people and make this product a success.